Precious, noble and exquisite, Alain Saint-Jonais cutlery is crafted in France by a group of artisans with a passion for design and a love for objects that have a history and a soul. As a member of the Atelier d’Art de France – a renowned federation of craft professionals in France – Alain Saint-Jonais takes the perpetual nature of their artistic craft seriously. 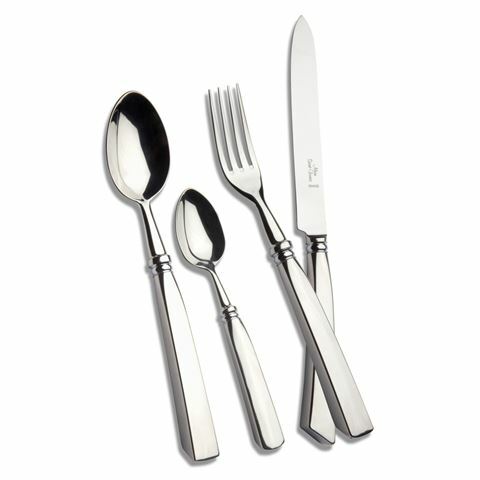 The result is cutlery fit to serve your family for generations. It’s easy to see why the Monaco pattern is a part of Alain Saint-Joanis’ Prestige collection. Crafted from 18/10 stainless steel, each individual utensil in the Monaco Place Setting is traditionally made in France boasting sleek, polished finishes and decorative ferrules. Made in La Monnerie, France. Crafted from polished 18/10 stainless steel. Each utensil boasts a decorative ferrule. Presented as a set of seven.